Collagen powder, also called collagen protein or collagen peptides, is a VERY popular supplement. Have you heard of it? Read to learn about what exactly it is, and how to know if you should use it. 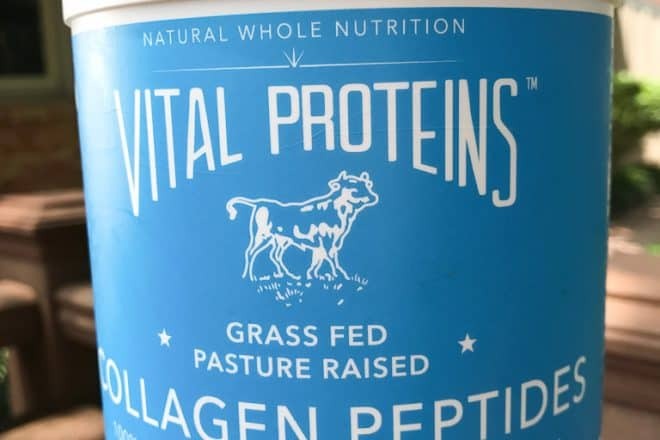 Collagen is a structural protein found in the connective tissue, skin, and bone in animals. In plain terms — it is a type of protein. Nutritionally speaking, collagen and gelatin are basically the same thing. Their differences come in with their chemical properties. Collagen is more broken down, and will dissolve easily in liquid. Gelatin, as you probably know, can form a gel-like substance. Collagen, and all proteins we eat, are basically just a combination of building blocks called amino acids. Although a lot of our body is made up of collagen, we don’t need to EAT a ton of it to maintain the collagen in our body, though the people who sell these supplements will obviously tell you otherwise. What is different about collagen vs. other proteins, like meat or eggs? Collagen mainly differs in its high content of an amino acid called hydroxyproline. This is not an essential amino acid, meaning, our body can produce it on its own. We do not need to eat it to make it. There’s not much known about any specific benefits to supplementing with hydroxyproline. If you regularly consume animal products like eggs and meat, you DO NOT need to worry about having a deficiency in essential amino acids. This goes for children, too. For example, my son weighs about 30 pounds. If he eats 1 egg and 1 serving of meat a day, he is going to meet his essential amino acid needs. If you’re vegetarian or vegan, you do need to be more conscious about your essential amino acid intake (although you won’t be using collagen peptides since it comes from animals!). You will see A TON of claims on the internet about how collagen powder will improve your skin, hair, and nails, that it’s anti-aging, it will reduce wrinkles, etc. Unfortunately there’s not a ton of research to really back that all up. Collagen supplements can improve skin elasticity, according to this study performed on women aged 35-55. But all the other stuff has not been proven, so take those claims lightly. What if someone told you that you had to eat more hair to have healthy hair? This is kind of the same thing. Eating more collagen is not going to suddenly make your body produce more. Collagen IS something we should consider getting in our diets, however. We tend to eat too much meat, and not enough of the rest of the animal. And collagen doesn’t necessarily have to come from a supplement. You can get collagen naturally by eating other parts of the animal besides the meat – like bones, cartilage, and tendons. Yummmm. Yeah, that’s why people make bone broth! Simmering those parts of the animal extract the gelatin/collagen so you don’t have to gnaw on some beef tendons. The bottom line is to think of collagen like another source of protein, not some magical supplement. Should I use a collagen powder supplement? Do I think that you’re going to experience amazing, life-changing effects from using collagen? Probably not. But do I think it is a good option if you choose to include a protein supplement in your diet? Yes! There are a TON of wacky protein supplements out there that are not good for anyone. So in the supplement world, collagen is one of the purest options that you can find. I’ll recommend some brands below that are high quality, because unfortunately, not all of them are created equally. I would start with just one scoop a day. Our bodies only need and utilize a certain amount of protein. It’s different for everyone, but if you get a good amount of protein in your diet from regular foods, then there is no benefit from consuming extra through supplements. I would recommend using a collagen protein supplement if you eat very little meat, or if you need a convenient protein option. I know a lot of people rely on smoothies for a quick breakfast. Adding a scoop of collagen can increase the protein content to help keep you fuller, as well as contribute to your daily protein needs. Or say you’re having a plain bowl of oatmeal – adding some protein would help round out the meal. I’ve also seen some people adding collagen to their morning coffee. You can do this, but it’s basically the same thing as if you add more protein to your breakfast. Say you’re eating eggs and chicken sausage with your cup of coffee. Two eggs plus a chicken sausage will give you about 25 grams of protein. That is plenty!! No need to add more. Yes the protein powder will make you feel fuller, but the benefits end there. These are reputable, high quality collagen powders. Should I use it for a protein shake after a workout? It depends. I know, that’s a cop out. But it seriously depends on so many factors. Feel free to contact me if you need some help figuring out nutrition related to your workouts. Should I give collagen to my kids? For a detailed response, read my recent post. I’m not opposed to this entirely, but you want to be conscious of the amount. Kids do NOT need a ton of protein in their diet. If you’re making smoothies in the morning and want to add a scoop, go right ahead. But keep it balanced throughout the day. Kids don’t need a protein smoothie plus a protein bar for a snack plus meat at every meal…it’s just not necessary and may crowd out other types of nutrients that their bodies need. I’m pregnant/nursing…is collagen safe for me? If you’re unsure, check with your OB/GYN or midwife. Through my research I don’t see any adverse effects for pregnant or nursing moms. However, there is some research that suggests a very high protein diet during pregnancy may negatively affect the baby, so you’ll want to avoid overusing any protein supplements. Sign up for my email list for exclusive subscriber content to make feeding your family easier! Hi, I dont eat red meat but eat Turkey, Fish and chicken so am concerned about taking the collagen with beef. I am in my 60s and do have some joint problems so trying to take whats best for arthritis etc. Thanks.